Merging the experimentalism of space rock with the structure of progressive rock, drawing on influences ranging from Pink Floyd and Ash Ra Tempel to King Crimson, The Future Kings of England (great band name!) still manage to create a unique sound that gives strong nods to their forebears without sounding too retro. It’s quite a feat. From the opening chill of space winds, echoing sonic textures and haunting violin, to the deliciously creepy narration buried deep in the mix, to its complex, soaring guitar and Mellotron driven finale, 10:66 sets the tone for a dazzling musical trip on this three song EP. Even the much shorter October Moth has intriguing twists and turns in its relatively brief three minutes, from its almost pastoral melodic guitar picking, and melancholy weeping of slide guitar, to racing passages of pounding (yet still beautifully melodic!) guitar and swooshing electronics. Lily Lockwood finishes things off, starting out slowly with a lovely guitar section, undercut again by spacey Mellotron, which all slowly builds, bringing in the fuzz driven noise of modern rock, weaving it in and out of the complicated rhythmic structure, to a strange and disorienting psychedelic middle with plenty of deep space textures flowing through the heavy guitars, finally ending with a exquisitely beautiful and dreamy space theme. 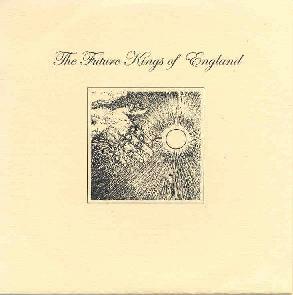 If this three-track demo is any indication of the things to come from The Future Kings of England, then I can’t wait till their full-length release comes out later this year. You may visit Their Majesties at their web site: http://www.thefuturekingsofengland.com. Also visit the Backwater Records web site at: http://www.backwaterrecords.com. Contact via snail mail c/o Steve Mann; PO Box 51; Ipswich; Suffolk; IP4 4AN; England.